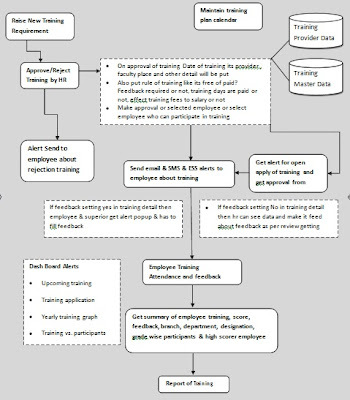 Training Module can Identification of training needs and developing skills & competencies of employees is an important part of Talent Management. Training MasterCreate master for all training that organization commit /conducts for their betterment of their employees or for new joinees. Training ProviderIf training is conducted by external source then the details of the external provided can be entered here. Training PlanAll details regarding the training to be conducted viz. date, time venue, budget, candidates participating, alert to each participant irrespective of branch, department etc can be decided here. Training CalendarCalendar that shows all the upcoming training scheduled. Training FeedbackFeedback given by the participants’ supervisor based on their performance in training conducted with their performance chart. Training HistoryShows history of all training conducted and score of each participant/s.